Lichtenfels (D) / Velsen-Noord (NL) – Blok Group, from the Netherlands, a top level technical partner in Engineering, Prototyping, Production, Assembly, Industrial services, Project Supply Chain Management and 3D-printing, is investing in two new laser melting systems from Concept Laser. They include an X line 2000R® system, which combines the largest build envelope currently available with the latest multilaser technology for reactive materials. A new M2 cusing supplements the manufacturing range in the medium-sized system segment. The Blok Group views itself as a trend-setter and innovator with a comprehensive range of services for developing and producing high-quality components and solutions for demanding industries, including the aviation industry with its high quality and safety requirements. The Blok Group's development and manufacturing processes therefore comply with the AS 9100 C Aviation Standards, developed by the International Aerospace Quality Group (IAQG). Concept Laser's systems come with the tools, which the Blok Group needs for QS and documentation, and provide valid data during the build process. The new X line 2000R® at Blok will be the first system of this scale in the Netherlands. With a build envelope of 800x400x500 mm3, the X line 2000R® currently offers the largest build envelope for laser melting metals. 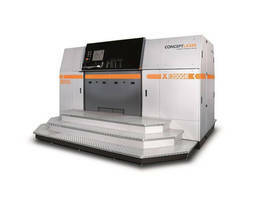 Its heart, the dual laser system in the X line 2000R®, is based on two 1,000 watt lasers. The useful build volume also increased nearly 27% from 126 l to 160 l compared with the X line 1000R. In addition, the X line 2000R® features a new sieving station that uses a quiet vibrating sieve instead of the tumbler sieve. The concept is incredibly compact, as the oversized particle container is now smaller, and has been integrated into the sieving station. The new sieving unit reduces the unit's footprint – and its fully enclosed design keeps the surrounding area clean and tidy. The dose unit has also been redesigned. The dose chamber is now filled completely and fully automatically within one cycle. Erik Blok, CEO of the Blok Group: "Speed and volume are important requirements for high-quality, economical production. The benefits offered by the X line 2000R® can also be seen clearly when compared with competing systems: It offers almost three to four times the build volume. Overall, the 2nd build module gives us high availability, 24 hours a day, 7 days a week for additive manufacturing." The design of the X line 2000R® system is also suitable for processing reactive materials. The investment in 3D printing is testimony to a strategic, long-term partnership between the Blok Group, Landré and Concept Laser. In the partnership, the Blok Group serves as the technical manufacturing service provider, Landré is the local sales partner and Concept Laser is the system provider. Oliver Edelmann, Head of Sales Marketing at Concept Laser, describes the partnership as follows: “We are delighted to have found an important strategic partner in the Netherlands in the Blok Group. A partnership of this kind offers the processing company an opportunity to combine materials expertise and new design approaches for 3D geometries with optimal system parameters. This allows us to blend application requirements perfectly with system and process engineering options." Erik Blok adds: "This network allows us to operate in two directions: Redesigning existing products which until now have been built conventionally via machining, and manufacturing new products which are developed specifically for the opportunities that additive manufacturing offers as early as the design phase. Overall, the additive solutions offer diverse potential which cannot be achieved, or cannot be achieved satisfactorily with conventional machining strategies. Erik Blok: "As a leading manufacturer in the Netherlands metal industry, we intend this strategic investment to drive our future-proofing forward. The Blok Group is known for investments in the latest manufacturing technologies. In the early 1990s, we were the first company here to invest in state-of-the-art lathes and milling machines. And now we are the first to purchase the most advanced system technology for additive metal manufacturing. Our goal is to maximize the value added for us and our customers and to make the most of the options offered by the process." The Blok Group's development and manufacturing processes comply with the AS 9100 C Aviation Standards, developed by the International Aerospace Quality Group (IAQG). Many of the group's customers come from the aerospace industry. The Blok Group offers customized solutions and strives to establish long-term partnerships along the supply chain. It prioritizes customer satisfaction and quality, which are the company's strategic goals. The group's staff of over 136 position the Blok Group as a full-range supplier which can cover the entire supply chain for the customer. Concept Laser systems stand out due to their stochastic control of the slice segments (also referred to as "islands"), which are processed successively. The patented process significantly reduces tension during the manufacture of very large components.